With the 4th of July recently passing, we started to think about the American Dream. “All men are created equal” and “endowed by their Creator with certain inalienable Rights,” including “Life, Liberty and the pursuit of Happiness.” Yadda yadda yadda! Everyone reading this blog has heard those words before. The Declaration of Independence outlines the American Dream for us in a pretty powerful way: life, liberty, and the pursuit of happiness. Over the years, Americans have tried to define the American Dream several times, but it is difficult. After all, we are all on a different journey when it comes to the pursuit of happiness. What makes you happy may not be what makes John Doe happy and so forth and so on. However, we still try to make concrete those principals first established by Thomas Jefferson in July of 1776. The general consensus is that the American Dream looks something like this: living in a beautiful suburban house (surrounded by a white picket fence, of course) with your wife and two kids. Is this what you picture when you envision the American Dream? Is this your idea of happiness? If so, you may be interested in what we have to say next. For starters, there is just something about a picket fence that screams curb appeal. Perhaps it is this idea of the American Dream that has fueled our love of the picket fence. Or maybe it is just the fact that these fences look good. Period! Perhaps best of all, picket fences are generally not very expensive. A picket fence is a low-cost way to fence in your yard, making it a perfect option for the cost-conscious homeowner with children or pets. 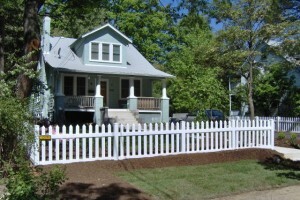 Available in both wood and vinyl, there is a picket fence that matches your maintenance needs. If you don’t mind painting, wood may be the way to go. However, if you want a more low cost option, go with vinyl. If you have any questions about The Benefits of Picket Fences, living the American Dream, please contact Hercules Fence, the largest residential fence company in Northern Virginia, by calling (703) 551-2609 or visiting our website. Also, check out Hercules Fence of Manassas on Facebook, Twitter, Google+ and YouTube! This entry was posted on Wednesday, July 9th, 2014 at 4:18 pm. Both comments and pings are currently closed.